Oh my these turned out so well!!! Battered deep fried zucchini sticks have always been my favorite appetizer back home but for some reason they are just not done here. So with no outlet to satisfy my craving had to make my own. Plus we just got a whole bunch of zucchini from lovely friends and relatives that grow their own and I can't think of a better way to have it, well, healthier yes, but never mind that!! I have made my own before but breaded them and shallow fried, this time I wanted to batter and deep fry (as is served in pubs and restaurants back home) but had trouble finding a recipe that didn't include egg. Came across this beer batter one, which is just beer and flour, and it worked perfectly. 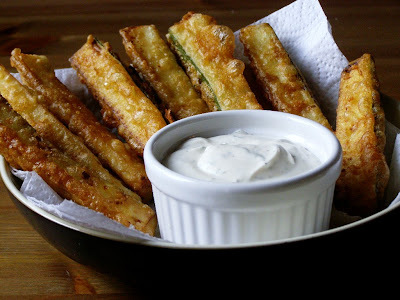 Now for the dip, zucchini sticks are almost always served with a ranch style dip which is most certainly not vegan. I found a non-vegan recipe and just decided to replace the mayo/buttermilk/sour cream with their vegan replacements. Trying it once made I wasn't too sure, seemed there was too much of a 'different' taste. However, with the sticks it's perfect - it simply needs to be dipped! Will definitely be making both these again and am thinking the batter will make great onion rings that will also go great with the dip. *EDIT* have made an even better ranch dip - recipe below!! Whisk 1 cup of the flour with the beer in a large bowl until smooth. Pour through a sieve into another bowl and let sit for 1 hour. When finished thin with more beer if necessary, it should be like pancake batter - I didn't need to add any more lager though. Cut the zucchini into sticks about 3/4 inch wide and 4 inches long. You need to have skin on each one. Heat the oil in a large pot - you want about 3 - 4 inches of oil until quite hot (360F if you have a thermometer) I didn't have one but found the oil needed to be hot - it was on maximum the whole time. Combine the remaining 1/2 cup of flour with some salt and pepper in a shallow bowl. Coat the sticks shaking off any excess flour. Give the batter a good whisk then dip the sticks in the batter letting excess drip off. Carefully drop into the hot oil in batches and fry until crisp and golden brown. Remove and let drain on paper towels. Whisk all together really well and chill in the fridge. I've never heard of deep fried zucchini before. I guess it is really about time, they sound very delicious. Oh! These sound so good and DH is growing courgettes (zucchini) at the allotment, so I think these will be on the menu very soon!